Let’s start out with some Dice-in-Vegas history. For years you were doing the Palazzo, the Riviera and the Palms, but also did Bally’s back in the day. I did Bally’s for 11 or 13 years—I would come there, like, three or four times a year. It was a big showroom. And then the Venetian for two years in the ’90s, and Mandalay Bay, the Luxor … I’ve always loved Vegas, so I actually bought a home there. With this resurgence I’ve been having, I went in to Vegas a few years ago and started rebuilding my act. I started at the back of a sushi place—Sushisamba. I did a room at the Hilton, at the Riviera, then to a little club at the Palms, then back to the Riviera. And while that was all going on my comedy career starting taking off: Entourage, Woody Allen movie [Blue Jasmine] and the comedy special I just did on Showtime. It’s called Indestructible, and it’s Showtime’s No. 1 comedy special of all time. I have a great history in Vegas, and that’s why the deal with Hard Rock is so exciting to me. I sorta started this resurgence, because I really put my head back into comedy. I went through a decade of divorce and bringing up my sons, and that became a lot more important to me than making career moves. So all I would do is perform and work on my act. And then before all this other stuff came into play, it built up in Vegas just like it did in Hollywood. Now I landed the Hard Rock Casino, which is the perfect place, the perfect demographic. It’s a rock ’n’ roll venue, and it’s a small room. I like everything about it, from the nightlife and the gambling to the chicks and everything. I really love it there. It’s the perfect home, and the perfect setup, what I envision Vegas being. What’s your mind-set as far as people going into this who might have a certain perception of you? What are you hoping audiences get from your show? Well, I’m probably the most aggressive comic on Earth. I have a rock ’n’ roll image; people who come to see me expect exactly what I give them, and it’s the kind of comedy I like to do. I make people laugh harder than any comic ever. Because I don’t hold back as a stand-up, and I’ve always prided myself on that. Even through when my career took off, from all the backlash, I’ve still stayed very true to who I am onstage as a comic. A lot of your career taking off had to do with starting at the Comedy Store in LA and also the Comedy Store in Vegas at the Dunes. That was my first gig in Vegas, and I was actually fired after my second show, because I wouldn’t stick to the script. What used to happen is the owner of the Comedy Store, Mitzi Shore, would try to make the comics rehearse their act. She would make you rehearse every joke you were going to do, almost like a record player, and I just couldn’t do that, because I always liked to feel the crowd. And so the second night she fired me. I’m not the type of comic who you can tell what to do. I do what I feel like onstage, and I crushed both of those crowds. I killed. … But my attitude toward that was like, “You know what? They’re just not ready for me yet.” And my career took off about four or five years later. And I wound up across the street on the marquee at Bally’s. Richard Sturm had an idea … Back then, you had all these acts in Vegas, you know, Liza Minnelli, Frank Sinatra, Wayne Newton; these are legendary people, and make no mistake, I love them. But Richard Sturm’s idea was, what if we brought in an act that wouldn’t be considered a “Vegas” act, meaning Andrew Dice Clay, back then drawing anywhere from 80,000 to 100,000 people a week on the road. He knew if I came in there, business would follow. And now it’s everybody from Cher to Britney [Spears] to Guns N’ Roses to Mötley Crüe. It became cool to play Las Vegas after Dice came in and started playing Vegas. It’s not even just entertainment in Vegas. Comedy used to be guys in suits with mother-in-law jokes. Exactly, but you know, there aren’t a lot of rock ’n’ roll comics out there. I mean through history. The one thing I have is that I’ve sold more tickets than any comic on Earth. The selling out of Madison Square Garden two nights in a row, that always comes up as the big career highlight, a mark of what’s possible. I did over 300 arena shows. Of course, the Garden is famous, and I did the Rose Bowl with Guns N’ Roses. I mean, there’s not a comic on Earth who can handle 100,000 people like that. And at that time when I did that show, Axl Rose actually called me at home; we were very good friends at the time, myself and the whole band. And I stopped doing arenas at that time, because I was starting to get claustrophobic. I can’t explain it, I can feel the audience going through you. And at that time 6,000 or 7,000 a night was what I was more comfortable with. Axl said I had to do the Rose Bowl with him, and I said to him, “I can’t face that kind of crowd.” And he said, “Dice, just look at the sky.” And he was talking common sense. And I said, “Okay, I think you got it,” and so I did that show, and now it’s in the history books. You mentioned the Woody Allen film coming up … I’m excited about it. As far as acting goes, it was a great film to be in, because it’s something I haven’t done yet as far as that kind of dramatic thing. It’s not like the kind of thing I do as a comic. It’s just straight-up acting. And to work with people like Cate Blanchett, Alec Baldwin, Sally Hawkins, people that have won Academy awards, Golden Globes, and being directed by Woody Allen. … The acting thing, you know, I’m not chasing it. I’m really more into my stand-up now. And have been really enjoying entertaining audiences live every night. I don’t like to travel as much; that’s another reason I like staying in Las Vegas. I definitely have the fire burning in me to keep moving. I give everything I got every night, all the time. Click Here for the full article written by Julie Seabaugh for Las Vegas Weekly. There is nothing to display yet, check back soon. 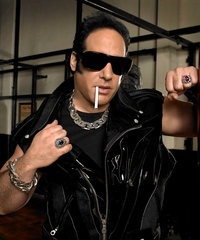 © 2019 Andrew Dice Clay. All rights reserved.